flew or are now flying this great aircraft"
The Caribou is a twin-engine, short takeoff and landing (STOL) utility transport built by De Havilland Aircraft of Canada, Ltd. It is used primarily for tactical airlift missions in forward battle areas with short, unimproved airstrips. It can carry 26 fully equipped paratroops or up to 20 litter patients. As a cargo aircraft the Caribou can haul more than three tons of equipment. The Caribou's STOL capability made it particularly suitable for delivering troops, supplies, and equipment to isolated outposts. The Caribou made its first flight in June 30,1958. In 1959 the U.S. Army flew several prototypes for evaluation and, in 1961, the first 22 out of a total of 159 production versions were delivered to the Army. 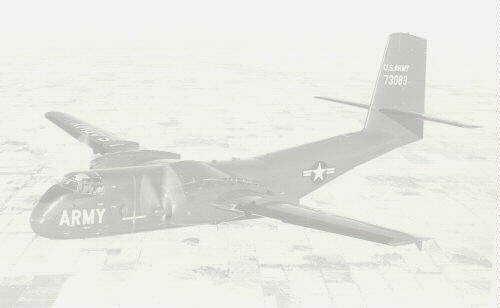 Originally designated AC-1, the aircraft was redesigned CV-2 in 1962 and retained that designation for the remainder of its Army career. In January 1967, when responsibility for all fixed-wing tactical transports was transferred to the U.S. Air Force, the Caribou received the designation C-7. By the end of production in 1973, a total of 307 aircraft were built.